RUSH: There is fire at the Notre Dame cathedral in Paris, and it looks huge. The wooden roof appears to be on the way to becoming fully engulfed. There was originally just a small plume of smoke that came out of it from a distant photographer, but now they’ve got news cameras in there, and it is massive, this fire at Notre Dame. RUSH: Notre Dame Cathedral continues to burn. The main spire there has collapsed. That’s one of the identifying architectural aspects of the cathedral. All the pictures that I have seen — and I haven’t had a chance to gaze for a long time at any of it — I don’t see any firefighting. I don’t see any water being sprayed on this — ah. There’s some. There’s some. But not on the main blaze. I guess they’re trying to save other parts of the roof. Looks like it’s a wood roof that’s just going up like balsa. RUSH: So President Trump has tweeted: Why don’t they fly over the cathedral and dump water on it? Must act quickly. Now, I’m told somebody listening to the top of the hour news on their local affiliate here on the EIB Network, and somebody actually reported French don’t know how to put it out. It looked like there was some scaffolding behind the cathedral. 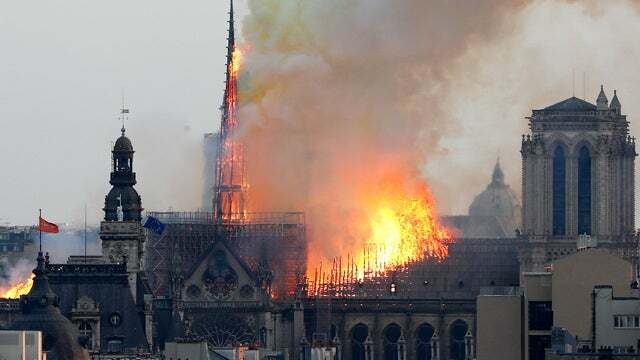 Is this a construction accident or – ahem — and if it’s arson, who in the world would want to burn down a Catholic symbol? Has anybody seen — no. Never mind. RUSH: I just saw a story here. Let me… From March 21st: “Catholic Churches Are Being Desecrated Across France — and Officials Don’t Know Why.” What do you mean, you don’t know why? It’s like saying we don’t know why “some people did something” on 9/11. “Some people did something.” I tell you what. This thing with Ilhan Omar, Pelosi doesn’t know it yet, but she has been totally taken over by Twitter. I made that point late last week. She doesn’t know, but she’s being fooled. These people all are thinking that Twitter is their base — and maybe it is, but I don’t think so. RUSH: So Mr. Snerdley, what did that AP report say about the fire at Notre Dame? Hm-hm. All right. What mixed with water? Okay. So the AP just reported the following, folks. Ash mixed with water fighting the fire at Notre Dame is choking the atmosphere? Meaning what, we should not do this? I told you. I told you it was gonna have a climate change element to it. I told you that the reason that they were not being full-fledged in trying to put this thing out was some newfangled climate change connection. And so ash mixed with water is choking the atmosphere. Never mind the people that might be there watching it. We’re choking the atmosphere. What happens when the atmosphere chokes? What happens when you choke? What happens when you choke? (choking sounds) Somebody has to come along and pound you on the back, right? You can’t breathe, right? The atmosphere in Paris at Notre Dame is choking all because we’re trying to put out a fire. The atmosphere is choking. I’m waiting for eyewitness accounts of this. I hope there’s videotape of the atmosphere choking. Do not doubt me when I start commenting on these left wackos and — you wait. The climate change characteristics of this that they’re gonna make up are — many of them we may not have even heard yet. But to them this is an opportunity to promote the whole climate change motif, if you will. Is France using up all of its carbon credits for the year? I don’t know how they can ever be in balance after this. I mean, in one sense that is checking the atmosphere. All the CO2, the greenhouse gas emissions, Paris might flood because the river might rise because of this. Or maybe this will prevent sunlight from getting into Paris and it’s gonna cool off and maybe it’s gonna help for a while, which would advocate for more fires and more ash. But then the atmosphere chokes, so damn it, no matter what you do to try to save the planet, the planet comes around and screws you! RUSH: One of the spokesmen for the fire at the Notre Dame Cathedral in Paris was just quoted as saying nothing will remain in the frame. What is this? Airdrop of — they took it away. It was another one of these wacko things. “Airdrop with water could threaten rest of structure.” Airdrops with ash or some such thing. So climate change. Anyway, the spokesman says nothing will remain of the frame. Do you know how much precious artwork alone is inside this cathedral? This is big. It’s amazing.